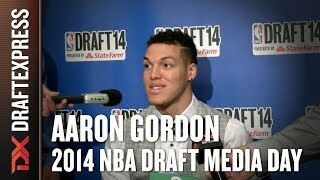 We joined Aaron Gordon as he works out in preparation for the 2014 NBA Draft, and discussed a number of topics with him, including what he's trying to improve on in the short-term and what he feels he can bring to a NBA team. Aaron Gordon has played a key role on 20-0 Arizona's emergence as the #1-ranked team in college basketball, showing tremendous versatility as a defender, passer, finisher and all-around glue guy. With that said, his offensive limitations--he's neither a prolific, nor particularly efficient, scorer--cause some scouts to question just how high his NBA upside might be. Tough road games against Duke, Michigan, San Diego State and UCLA have given us ample opportunity to evaluate Gordon's strengths and weaknesses as a prospect, which we've done in the following video scouting report, courtesy of Mike Schmitz. Likely the best athlete on the roster, Aaron Gordon will undoubtedly play an important role on this squad, as he proved to be one of the most versatile players in attendance throughout the training camp in Colorado Springs. Showing an extremely unique blend of physical attributes, intensity and smarts, Gordon set the tone right off the bat with his no-nonsense attitude, having no qualms whatsoever about going into the paint and making his presence felt. He grabbed seemingly every loose ball that came off the defensive glass, often skying well high above the rim to do so, and then sometimes initiating the break on his own. He also showed a little bit of a post game, utilizing his superior quickness and aggressiveness to score points, despite not possessing an overly advanced back to the basket arsenal or the thickest frame around. Defensively, Gordon was everywhere, switching out onto guards, making plays at the rim, and playing with a fantastic motor to compliment his tremendous athleticism. While Gordon isn't the most skilled player aroundhis ball-handling skills in the half-court are somewhat crude, and his jump-shot still very much on the streaky sidehe impressed again and again with his terrific passing ability. He's an extremely unselfish player who reads the floor well and finds the open man consistently for easy baskets. Although question marks remain about how effectively he'll score in the half-court early on in his career until his skill-level increases and his frame fills out, his high basketball IQ will certainly help him contribute in other areas in the meantime. Even though it still seems like Gordon's biggest advantages lie as a mismatch threat at the power forward positionboth facing the basket or making plays around the rimhe's likely talented enough to make it work wherever he plays. Arizona is indeed planning on starting him at small forward next season according to what we've been told, but he'll see a good amount of time at power forward as well. Either way, Gordon has to be considered one of the top prospects in next year's draft class, and he'll be heavily scouted on this USA Basketball team in Prague. Outlook: One of the youngest players in his class. Appears to have significant upside still. Body should continue to fill out impressively. Already extremely productive despite some clear limitations, thanks to effort level, athleticism and smarts. -Has some back to the basket skills. A modern power forward who shows flashes versatility offensively, but is still improving his skill-level and polish. Incredible athlete who has drawn some comparisons to Blake Griffin due to his complexion and highlight reel dunking ability. Struggled with injuries in the tournament we watched him, but still gave 100% every moment he was on the floor regardless. Has excellent long-term potential, especially if he can develop a consistent jump-shot. One of the youngest players in this high school class.